On a hot day, a tall glass of lemonade can cool the heat of summer. Once that meant trekking to the store and hauling back a heavy bag of perfectly colored, flawless lemons, kneading 20 or so to release every ounce of juice while praying not too many seeds get loose in the mix, and then getting the water and sugar concentrations right. "Real Simple" magazine has a better way. It tested four styles of lemonade from concentrate and found that frozen lemonade tasted better and provided more flavorful options for lemonade-inspired summer treats. Five such recipes appear in the June/July issue of the magazine. "Real Simple'"s Kris Connell says, "Seriously, who really has time to make lemonade from scratch. Plenty of people do, but so many would rather not deal. With July 4th around the corner and the barbecues all summer, the last thing many want to do is squeeze lemon upon lemon to make lemonade. I rely a lot on my freezer, so this works out just fine." It can be made days in advance and served right out of the freezer. One need not have an ice cream freezer to finish this job. A very cold home freezer will work just as well. Puree the concentrate, water, and berries in a blender. Spoon into the blender and process until smooth. Freeze in an ice cream freezer. Or pour into a shallow metal baking pan, cover, and freeze until firm, about 6 hours. Makes 1 quart. This very popular Spanish drink is so simple that guests will not believe you managed to prepare the cocktail in this fashion. 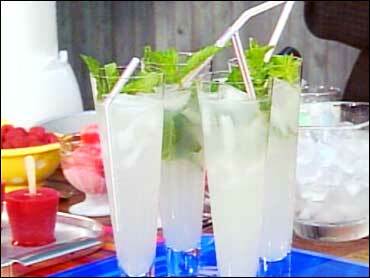 If you're feeling a little shy, you can hold the tequila or rum and serve only as a lemonade drink with a hint of mint. Combine the mint and concentrate. Stir together until the concentrate thaws. Add the tequila or rum, if using. Pour over ice and top with seltzer. Garnish with mint. Makes 6 drinks. Combine all the ingredients in a small saucepan and simmer for 10 minutes. Refrigerate for 20 minutes; strain. The syrup will keep covered, in the refrigerator for up to 2 weeks. Drizzle it over cake and ice cream, or use it to flavor plain seltzer. Makes 2 1/4 cups. Combine all the ingredients in a re-sealable plastic bag. Use to marinate pork, chicken, or fish for 20 minutes to 4 hours. Makes about 2 1/2 cups. Puree the concentrate, water, and berries in a blender. Pour into (8) 6-ounce paper cups and transfer to the freezer. After 1 hour, place a wooden craft stick into each cup. Freeze completely. Peel the paper away to serve. Makes 8 pops. Note: Of all the lemonade tests, "Real Simple" found Minute Maid Lemonade from Frozen Concentrate to be the best.